Home > Community > Contests & Winners > Doing Good > Let’s FIGHT Hunger Together! Here at Love With Food, one of our core values is to give back to those in need, and we know that our community of snackers value this as well! With over ONE MILLION meals already donated, we have made it a priority to donate a portion of our proceeds to food banks to help feed the hungry across the US. Now we’re looking to you to help us make our next major donation. Over 25% of all households in big cities suffer from food insecurity and we want to help. We’re launching a new initiative, the Give & Get campaign, where you get to help us fight hunger! To kick off this new initiative, we’re launching in two of the nation’s densest cities, San Francisco & New York. In San Francisco, we love the SF Marin Food Bank. Learn more about SF Food Bank here. In New York City, we love the Food Bank NYC. Every year, this organization gives out over 62.5 million meals. Since 1983, they have provided over 1 BILLION meals and their programs and services have helped out over 50,000 children! Learn more about NYC Food Bank here. HOW DOES GIVE AND GET WORK? TWEET your support to rally your friends to participate! You can do this by clicking on the Tweet on Twitter. Have a city/state you’d like us to launch in next? Be sure to answer the question when you enter below! Stand a better chance of winning by clicking Refer Friends for Extra Entries. WHAT WILL YOU AND THE FAVORITE CITY GET? The GIVE. 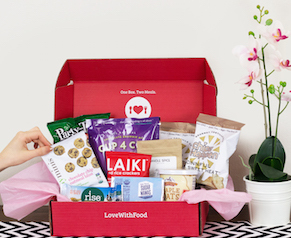 The city (either SF or NYC) with the most VOTES will receive a special delivery of over 1,000 goodies from Love With Food in August 2017. No strings attached. The cities with the most nominated tweet will be included in the next Give and Get campaign. Now the GET. 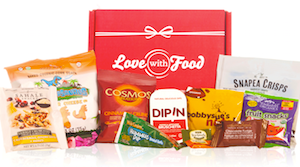 3 lucky entrants who voted for the winning city will get our August boxes (Tasting, Deluxe and Gluten-Free). That’s over $50 worth of snacks per winner! Will announce the winner in August after voting ends on 8/4/2017.